Cozy Inn proprietor Amanda Fong, left, hands a to-go order to customer Katelyn Pothour at the iconic downtown Janesville restaurant in this Feb. 8, 2019, photo. Fong’s mother, Cai-Yun Tan, died Monday at age 70. Family members have made the Cozy Inn what it has been for generations, with owners and their families doing much or all of the hands-on work. The iconic Janesville restaurant closed for a few days last week after a key member of that team died. 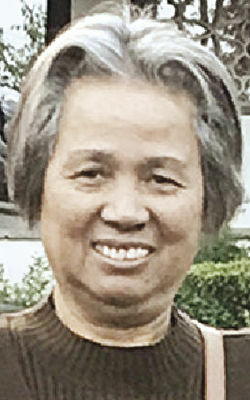 Cai-Yun Tan died Monday at age 70. Tan was born in China and lived through the turbulent years of the Cultural Revolution in the 1960s and ’70s. The vast country suffered sometimes violent social upheaval and hunger. Tom’s mother, Marie Shum, bought the Cozy Inn from previous owners in 1975. Fong married his wife, Amanda, in China, and they sponsored her relatives’ immigration to the United States, Tom said. The first to come over were Tan and her husband, in the early 1990s. Tan worked in the restaurant—mostly in the kitchen—for many years. At the same time, she worked at the now-defunct Rice Bowl and Wong’s Garden restaurants, Tom said. When Shum retired in the late 1990s, Tan and Amanda bought the business. Tom Fong was working at General Motors at the time, he said Saturday. Amanda then took over management with Tan and Amanda’s sister, Michele Zhu, Tom said. Tan enjoyed the restaurant, but “after a while she started working less because there were quite a few grandchildren, so she started taking care of them,” Tom said. She had 13 grandchildren and one great-grandchild when she died, Tom said. “She really loved her family,” he said. Shum, by the way, is 84 and still helps out at the Cozy Inn from time to time, her son said. She was a pioneer in her day. Tom said she was the first woman to work as a head chef in a Chinese restaurant, where men traditionally ruled the kitchens. Shum ran the kitchens in several Milwaukee restaurants before coming to Janesville, according to a 1975 Gazette article. The Cozy Inn is the second-oldest U.S. Chinese restaurant operating in the same location, Fong said. The longest has been operating 11 years longer. It’s in Butte, Montana. A Facebook post recently sparked a rumor that the Cozy Inn might close, but people turned out to support it, and again when The Gazette ran a story mentioning the business, Tom Fong said. Fong said the family has no plans to close the restaurant. He is looking forward to reaching the 100-year mark for the restaurant in 2022.